It was like a freight train hit the building. Wil McLellan was in the boardroom of New Zealand game developers Stickmen Studios when he felt the room start to vibrate. Then it whipped to the side. "People were thrown from chairs and the rooms without windows went pitch dark as the power went out," McLellan said. "The noise was immense—lights falling, glass smashing, crashing bookcases—and the rumbling roar of the quake itself. We were all aware that this was far worse than the last large earthquake a few months previously and I think it fair to say everyone was just hoping the building would survive." Once the quake subsided, the team of developers made their way through the dim light and dust, working their way down the stairs and out of the building. As the team walked out into Cathedral Square, in Christchurch, New Zealand, a second tremor hit and buildings began to collapse around them. Thousands stood in that town center watching the city shake in what would become the second most devastating earthquake to hit the country. The final death toll of the 6.3-magnitude earthquake is expected to be more than 200, and the cost to rebuild the city could be as high as $30 billion NZD, or about a third of the country's gross national product. 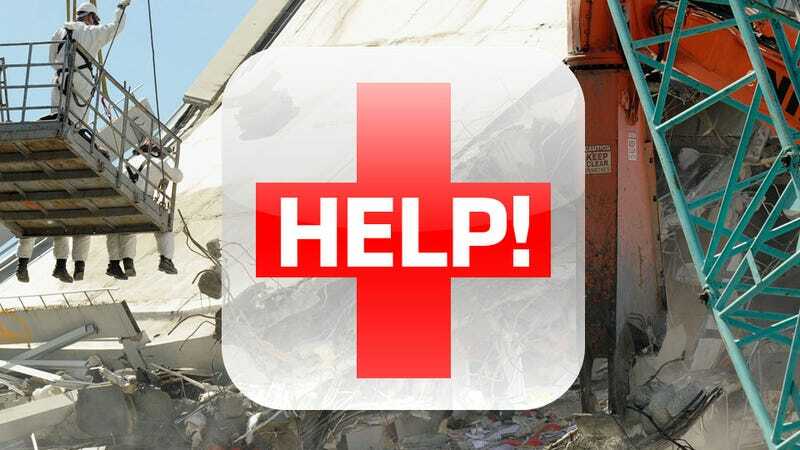 In the wake of the earthquake, Jos Ruffell, portfolio manager for game app developer PikPok, started to contact other iPhone developers in New Zealand to see what they could do to help out. They came up with App Appeal ( http://www.appappeal.co.nz/ ), donating all proceeds from the sale of a collection of apps and games for the iPhone and iPad to Red Cross to help the quake victimes there. The fundraiser brought in $22,000 in the first week and sales for the effort will run until March 26. "I sent emails to several other developers on Thursday morning, (the quake was on the Tuesday, Feb. 22) and within 20 minutes we had a core group of six developers onboard with the idea," Ruffell said. "The reaction so far has been fantastic. We have had developers from all over the world get in touch and pledge their app earnings. Many of the developers supporting the appeal are single developer studios, and the app store represents their entire income, so it's quite overwhelming to receive this level of support." Among those helping is David Frampton, developer and founder of Majic Jungle Software. Sales of his game Chopper 2 alone raised $5,700 NZD in the first week. Frampton is based in Wellington, New Zealand, but his mother, Ann Bodkin, works in Christchurch at the six-story PGC House on Cambridge Terrace. "She was caught under her desk in the rubble of the collapsed PGC building," Frampton said. "We didn't hear from her for nearly 24 hours, which was very difficult for us, especially seeing the state of the building. Amazingly, rescuers found her alive and well, and within a few more hours they had got her out with only minor bruising. "She was the last person pulled out alive from the rubble. So we are all feeling incredibly lucky." I asked Ruffell, days before the horrific events of Japan's 9.0 magnitude earthquake, whether he would ever consider expanding the effort to help others in need. "We have certainly seen the power of digital distribution in New Zealand," he said at the time. "It has allowed small developers to create, publish and earn a living making games at essentially the bottom of the world. Matching this to charity efforts that can cross boundaries and reach a global audience is really exciting, and has certainly allowed people to support the cause that we would normally struggle to reach." Already in Japan, game companies are coming together to try and raise funds to help the reeling country. Koei Tecmo, Microsoft, Namco Bandai, Nintendo, Sega Sammy and Sony have contributed more than $18 million to earthquake relief efforts, and at least one iPhone game developer is donating all sales to the efforts. You can donate too, directly to the Japanese Red Cross Society.